Synopsis: Two school friends/former lovers, one Pakistani and the other a former neo-Fascist, reunite to renovate a launderette in a comedy-drama about immigrant families, changing values, racial tension and sexuality in early 1980s London. 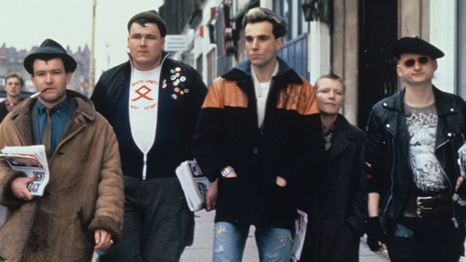 Movie that launched the careers of director Stephen Frears (Dangerous Liaisons, The Queen, Grifters) and some actor named Daniel Day Lewis (My Left Foot, et al). Saeed Jaffrey, Rita Wolf and Shirley Anne Field are all well cast as the Hussein family patriarch, his wild daughter and mistress. Jeffrey and Field as mature lovers exhibit a great deal of chemistry together. Landmark in depiction of gay relationships in UK mainstream films. The romance between the two leads is very matter of fact. These are among the first male-to-male kisses I ever saw and there is no apology for them. Johnny (Lewis) and Omar’s (Gordon Warnecke) first kiss says so much about the passion of their past relationship that we really don’t need the details of their history to believe that they want to rekindle something. The relationship between them is complicated by not only by racial tension, but work requirements and Omar’s desire to make Johnny an employee. Their relationship is not reduced to “us vs. the world who hates us”, but has other more immediate social complications. The opening of the newly renovated “Powders” launderette in which Johnny and Omar start to make love oblivious to the fact that Rachel and Nasser are dancing outside is as romantic and suspenseful as ever. The soundtrack is faceless mid-80s synthesizer. Even the Skaters Waltz gets the synthesizer treatment. The political reference points are somewhat dated. Thatcher has been out of power for 25 years now. The Battle of Lewisham which is referenced in the film was 38 years ago. The irony of an Englishman on the dole working for a Pakistani family that has swallowed Thatcherite on-you-bike nationalism wholesale is probably going to be a little lost on the younger viewers. The standard things that date movies from the 1980s – VCRs, payphones, Jheri-curl, etc- date the film. The “menacing” thugs just don’t appear menacing in the thugwear of the period. The thugs of the times are more clownish than menacing. In general, the film’s multi-dimensional approach to challenges “successful” immigrant families face is current. The politics which could date it are not the central point of departure for the film. Instead the focus is on a family struggle between an upper class immigrant values and working class resentment which may not have changed much. The relationship between Omar and Johnny appears so contemporary. Neither appears to be troubled by their sexuality. While the relationship is to remain hidden, it isn’t bogged down by the internalization of social shame of the time. 30 years is a long time in the film world, and classic films are easily forgotten, but I do not see a compelling reasons for a remake. Is “Thatcherite” London such an interesting period that we want to see that setting again with new actors? An update would be possible, since the issues are still around, but setting the story in the contemporary England wouldn’t add anything to the story. I wouldn’t mind a sequel, however. There are lots of simmering issues in Johnny and Omar’s relationship and I would be curious to find out how they managed to stay together. Could Omar stop treating Johnny as a prize? Would they work themselves out of their passion? Rita Wolf’s Tania is probably the most interesting character in the film and I could see making a film about what happened to her after she ran away. Was she “cursed” with children as out-of-control as she was. Worth a revisit, but not a classic. This entry was posted in Comedy, LGBT, Milestone Review, movie reviews, UK and tagged 1980s movies, 1985 Movies, 30 year anniversaries, comedies, daniel-day-lewis, movie reviews, my beautiful launderete. Bookmark the permalink.